Saturday mornings are so relaxing. Even though I didn't sleep in, which was common before I adjusted my sleep schedule a few months ago, I had a lot of energy and was ready to take on the world. However, now that my daughter has taken on the characteristics of a full-fledged typical teenager, my day doesn't seem to get started until 10 or 11 a.m. I've been up for over four hours and not much to say for it, other than wiping out the backlog on my Tivo. The other thing I get to do is catch up on my blog reading. I read a few dozen blogs semi-regularly, and there are a lot of good writers out there. I always find out something new, and I'm constantly updating the list of blogs on the left-side of my own blog. There's a lot to recommend, though don't assume that just because I provide a link means I agree with the opinions they share. I just find them interesting. I've been challenged recently by a new work schedule, which places me right in the heart of rush hour, both morning and afternoon. I hate it, to put it bluntly. It is unreal to me just how horrible we have it in the greater-metropolitan Washington, DC, area. My commute is now almost double what it used to be, yet it's the same distance. I've tried every shortcut I'm aware of, and apparently everyone knows every one of them. Traffic literally crawls. It is maddening. My boss said I should use public transportation. That would be great if there actually was reliable public transportation that was anywhere near where I live. Why Howard County doesn't have something other than commuter buses is beyond me. The buses have to use the same route that I use to get to work, so I'm not saving any time, and co-workers tell me they've abandoned using the buses because, in the afternoon, those same buses, which originate in DC, don't even stop to pick up passengers in downtown Silver Spring because they're already full, so catching one becomes an uncomfortable wait, especially when the weather gets chilly. Carpooling may be an option, but it won't get me to work any quicker. My boss loves that I'm at the office later in the day, however. Most of my colleagues are out of the office at 3, which is what time I used to leave over my entire 24 year career, until school started in August, which is why I had to adjust my schedule. My boss, who works until 6 pm everyday, loves having one of her managers in the office to handle crises that could possibly come up but never do. But I'm there. At least someone likes my new schedule. Dinner is a little later at our house nowadays. This makes it more difficult to come home and do things before dinner. No TV watching, no snacking, no errands, no cutting the grass, no resting... I come home and go write into food preparation. And with our emphasis on eating better, I don't like to get carryout or go out to eat as often, even if that's easier. It also means grocery shopping is more critical, as well. Instead of shopping for 2 or 3 days worth of meals, I need a full weeks worth, at least. Finding time to shop for groceries is a challenge, as well. It's a bad cycle, but it's my life. We haven't given up completely on going out to eat, though. This past Thursday, with a slew of gift cards in hand, we made our way to our local Red Robin restaurant. We realized, upon arriving, that the inside has been completely redecorated since we were last there, and that it has likely been three or four years since then. The menu has not changed, though, and we ordered our favorites. We then started to look at the staff to see if there was anyone we recognized. 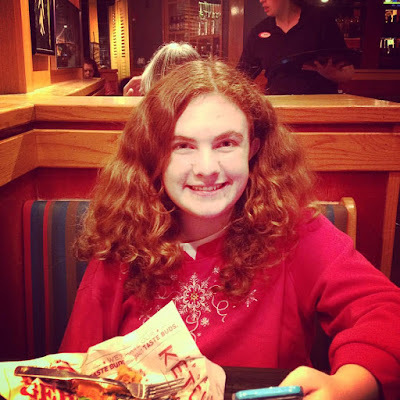 For about five years, we ate at Red Robin on a weekly basis, with family and friends joining us. It was a lot of fun, and a great opportunity for the grandparents to all get together with their only grandchild. We also got to know much of the staff, and some of those folks, who have moved on to other work, school, or other Red Robins, remain friends to this day. So we looked around, and sure enough, Lauren still works there! We got to know Lauren when she dressed up as Red Robin on Kid's Nights, a long time ago. And now she's one of the managers. That's pretty cool. She stopped by our table and greeted us, and it was great to catch up. My daughter is finally up, so I'm off to continue my Saturday. Have a great weekend, everyone!